Detect unauthorized access to your Mac. Is there a better alternative to MacinLock? Is MacinLock really the best app in Security category? Will MacinLock work good on macOS 10.13.4? 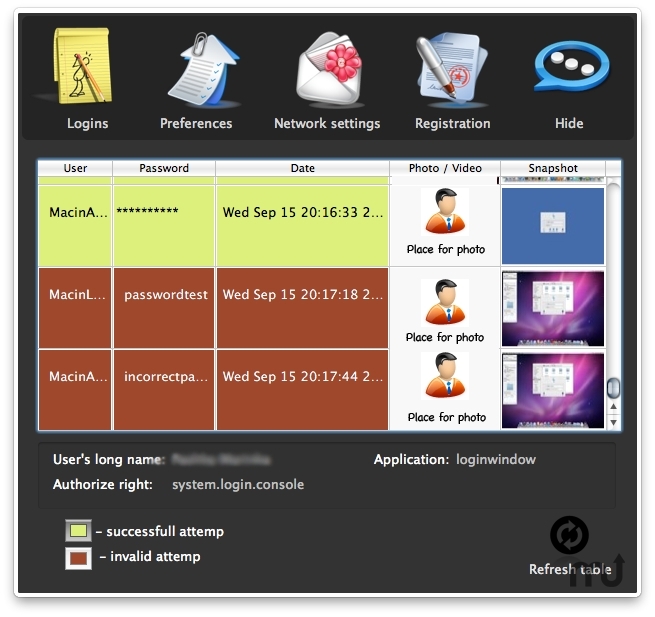 MacinLock is an application that allows you to observe all logins events and unauthorized access. If somebody want to login in your system, change your system preferences or run application, which need authorization when you are absent, MacinLock takes a photo and screenshot and uploads it to you. MacinLock helps you know who uses your Mac. Added MacinLock's icon to authorization window. Added autofilling in user name field. MacinLock needs a rating. Be the first to rate this app and get the discussion started!